Why are my fans called cHEwY gum gums? After 3 posts in 3 weeks (a record, believe you and me), I’m trying my best to blog at least once a week and post it on chewsdays, that’s Tuesdays for normal folk. Actually, don’t hold me to this promise because we’ll see how confident I am with my blog posts when the deadlines and August’s BookMonth visits hit haha. But I thought this one would be a good question to kick things off, why do I call my fans, cHEwY gum gums? 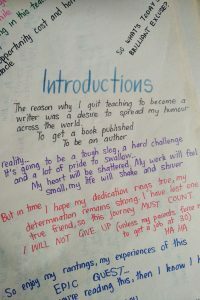 Let me take you back to 2007, when I first made a decision to become a ‘full-time’ writer. I started a scrapbook to map out my writing journey. As you can see from my prologue, I knew that it was going to be tough. I had an imaginary personal publishing company called cHEwY creations. Whether it was Christmas cards, notebooks or anything with my writing on it, I would add a cHEwY creations imprint and logo (a flower). Okay, so why cHEwY creations? The long-cut answer is that I think imagination and creativity is like chewing gum. You keep chewing on it until you blow a ‘idea’ bubble. I suppose when that bubble pops, it means the idea becomes a story haha. The chewing includes brainstorming, planning, drafting, or even just literally chewing/thinking about that idea. I suggest gummi bears for chewing purposes, just because. That’s why I rarely measure my writing time with a word count, because sometimes that pondering/wondering is important too. As Katrina Nannestad says, daydreaming is allowed! Oh, and in case you’re wondering, I’m up to Volume 4 of my cHEwY creations scrapbook…I may share a few more things in later posts. Watch this space.